I have been chosen by Krusteaz to be a paid brand ambassador. The recipe for Chocolate Chip Cheesecake with Brownie Crust also appears on Krusteaz.com. Sometimes you want two desserts. We’ve all been there. You’re asked if you’d like the brownies or the cheesecake. And it feels a bit awkward just to say “yes” and grab both. If you can identify with that, then this cheesecake is for you. It all starts with a fudgy brownie that will serve as the crust of the cheesecake. 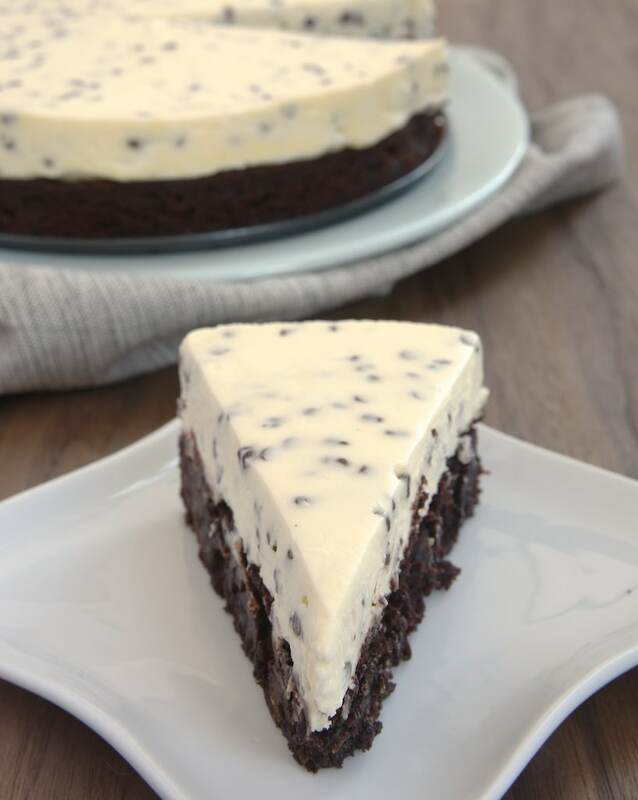 Then, that’s topped off with a simple no-bake cheesecake packed with plenty of chocolate chips. See? You get brownies AND cheesecake! Win-win! You can use any brownie you like for the crust. For a shortcut to an already simple dessert, I used a brownie mix, Krusteaz Gluten-Free Double Chocolate Brownie Mix. It’s one of my favorite brownie mixes, and you’d never guess that it’s gluten free. If you want a from-scratch option, use your favorite recipe for an 8-inch square pan of brownies. My Favorite Fudgy Brownies would work wonderfully. This is one of my favorite quick-to-make desserts. It’s so simple to put together. And with that bit of chill time, it’s a great make-ahead dessert, too. And when it’s ready to serve, you can enjoy a slice of this delicious two-in-one dessert! For more cheesecake recipes, come browse the Recipe Index!